All sighthound owners will be pleased to know I have tried to avoid roads and livestock areas as much as possible. 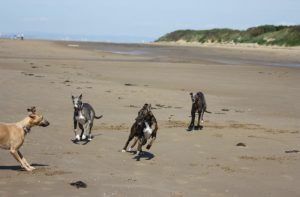 – Your sighthound is permitted to explore Berrow Beach throughout the year. – Great beach to let your sighthound run wild. – It is a 6-mile stretch of sandy beach with sand dunes. – One thing to be aware of is low tide which exposes soft mud near the water’s edge. – There is parking on the beach at designated areas or you can park next to the church and walk 5 minutes through the dunes and across the golf course. – When the tide is out, the wreck of MV Nornen, a Norwegian Barque which ran aground here in 1897 is visible. – Possibly the most picturesque walk on the list, the drive through Allerford and Bossington will give you a sense of stepping back in time. – You will find a national trust car park when you come to the end of the main road through the hamlet. – There are toilets in the car park. – The walk to the beach becomes even more beautiful with streams, thatched cottages, and paddocks with horses. – The pebble beach has sweeping views of the Exmoor coast looking towards Porlock Bay. 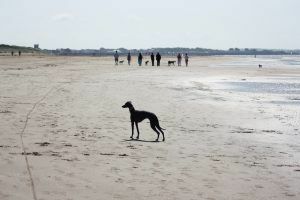 – There is a coastal path running along the back of the beach next to the very flat fields which are great for your sighthounds to open up away from the beach. – There is also a delightful tea garden opposite the car park. 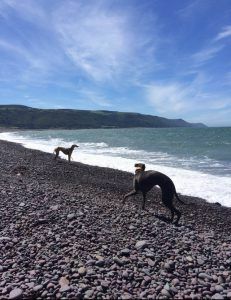 If you are looking for a pub lunch Porlock is 5 minutes further along the coast with dog-friendly pubs. – On the northern edge of the Blackdown Hills, Castle Neroche is part of a 35 square mile area of woodland and trails. – There is a free car parking area with picnic tables. – The site was once an iron age hill fort approximately 2600 years ago. Unfortunately, there are no forts visible nowadays. – It offers spectacular views of Taunton and over to the Quantock and Exmoor hills. – The walk has colour coded markers for your desired walk distances. – Dolebury Warren was a 3000-year-old iron age hill fort close to the village of Churchill. – The name comes from medieval times meaning rabbit warren. – There are excellent views over the North Somerset area as far as the Bristol channel. – The area is bursting with all types of wildflowers which in turn attracts many butterflies. – There are many different tracks to explore, some are signposted or you can just find your own way around. – There may be livestock here so do be careful. This isn’t really a walk but more of a day out to see other sighthounds and eat amazing street food. The market is on the first Sunday of every month and offers all kinds of handmade goods for humans and dogs, an enormous selection of food and drink from Italian meatballs to Nepalese momos. There is live music and an array of arts and crafts items for sale. But most importantly there are whippets, greyhounds, lurchers, Salukis, iggys….etc everywhere! If your sighthound is eager for a quick sprint around there is an open field area at the north end of the market. If you follow Willow Vale Rd, which by the way is picturesque, you will come to the off lead zoomies central area. – Exceptional 360-degree views across the Somerset levels, along the Mendip hills and over the Bristol channel to Wales. 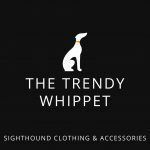 – It is high up so can get windy so make sure to wrap your sighthound up snugly in the winter. – There is parking in a layby to the south side of the hill along the Webbington rd. – Tarr steps are within Exmoor national park and are named after the ancient stone bridge that takes you from one side of the river to the other. – There are parking and toilet facilities. – The is also a lovely pub set above the steps for refueling. – A circular walk along the river with open spaces for your sighthound to run riot. We ship to the U.K, Europe and Internationally. Postage will be made within 1-2 days of order Monday to Friday. Items sent fully Tracked using Royal Mail.